Just a little bit of knitting …. I am getting ready for the last event of the season at Hampton Court Castle (not the palace!). This will be the battle of Mortimer’s Cross and is a War of the Roses event that I have not done before. It looks like a beautiful venue so have camera at the ready! 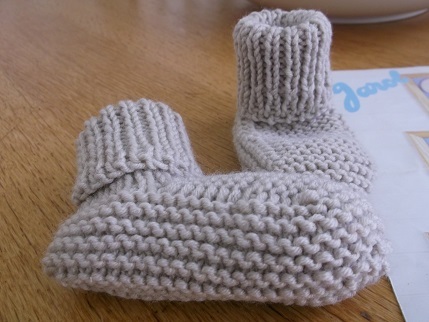 I have knitted some booties this week for my friend’s baby as I thought it might be a little chilly camping. Maria has been re-enacting with her parents all season and been a brilliant baby. She has a little linen outfit to wear so I thought the colour would be good with that. They are knitted with Sublime wool using a pattern that is 24 years old! When I was pregnant with Ellie I knitted some bootie and hat sets to go with her outfits. I really like the pattern as it is very straightforward to knit and the wool is very soft. Teaching starts again next week, can’t believe summer has gone so fast, have had a brilliant time. Looking forward to all my autumn crafting though. Have lots of lovely things planned both on my own and with friends. What a lovely end to the season! 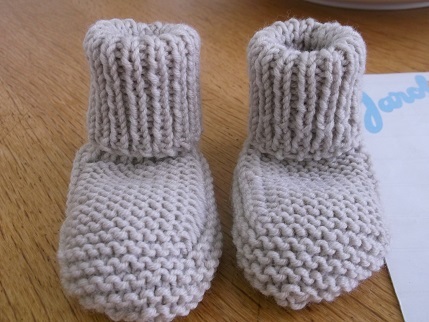 Those bootees should keep small feet cosy and warm!